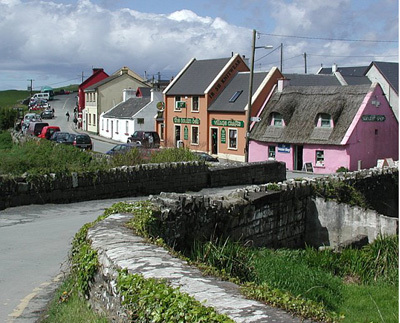 Traditionally a fishing village, Doolin is now renowned world-wide as the traditional music capital of Ireland. Home to thousands of international visitors each year, Doolin one of the best destinations in Ireland. For some it is a place to experience rousing music sessions nightly in the pub and for others it is a place of solitude and tranquility where one can refresh their spirits away from the everyday hustle and bustle of life. Doolin has been welcoming visitors for many years and some of the more popular activities are, visiting the magnificent Cliffs of Moher , or the archaeological sites in The Burren, finding the rare flora and fauna of The Burren, enjoying scenic country walks, visiting The Aran Islands, Sea Angling, watching the sunset, enjoying the waves, playing pitch and putt or trying some of the following more specialized activities. Caving, Scuba diving, Rock Climbing, Hill Walking or Mountain Biking. In Doolin Clare you will find a wide range of quality accommodation to suit all budgets, ranging from hotels, guesthouses, bed & breakfasts, holiday hostels, caravan and camping sites and self-catering cottages. Doolin restaurants offer fine foods with local seafood a specialty. Our world famous pubs feature traditional music sessions nightly and also serve tasty pub food. There is a varied and interesting range of shops with items to suit all tastes and budgets. 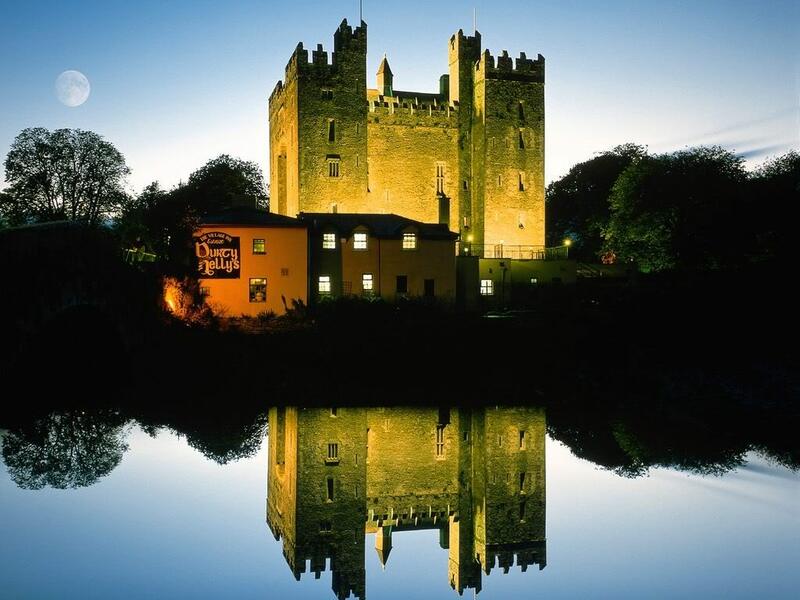 Other local attractions and places to visit, just a short driving distance from Doolin Cave include Bunratty Castle and Folk Park, Galway City and Limerick City. Ireland Calling provides information on things to do and places to see around Galway and Clare. Located on the West coast of Ireland on the Wild Atlantic Way, the Cliffs of Moher are one of Ireland’s top Visitor attractions. The Cliffs are 214m high at the highest point and range for 8 kilometres over the Atlantic Ocean on the western seaboard of County Clare. 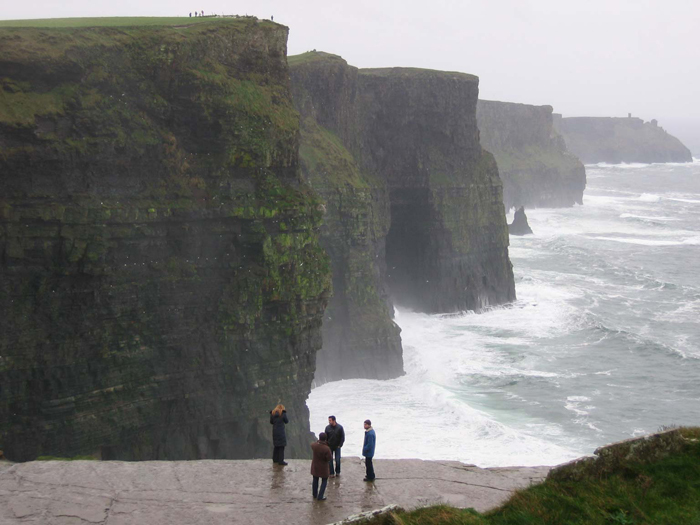 O’Brien’s Tower stands proudly on a headland of the majestic Cliffs. From the Cliffs one can see the Aran Islands, Galway Bay, as well as The Twelve Pins, the Maum Turk Mountains in Connemara and Loop Head to the South. The Burren is an amazing place. 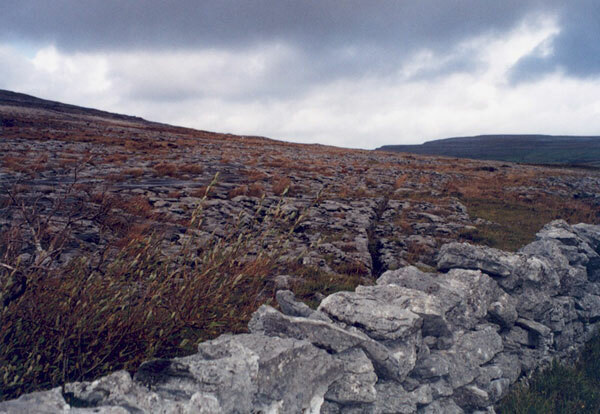 It is a karst limestone region of approximately 300 sq km which lies in the North West corner of Co Clare, in Ireland. It is composed of limestone pavements, which are eroded in a distinctive pattern known as karren. This pavement is crisscrossed by cracks known as grykes and underneath the pavement there are huge caves and rivers that suddenly flood when it rains. It contains dozens of megalithic tombs and Celtic crosses and a ruined Cistercian Abbey from the 12th century, Corcomroe. You can find villages abandoned since famine times and green roads on which you can walk for miles without ever seeing a car. And if you go in springtime you will find rare wildflowers such as gentian and orchids and bloody cranesbill. On the floor of this sea, shells, skeletons of plants and animals and coral were deposited and compressed and over millions of years formed limestone. Like our own bones the rock is high in calcium carbonate. These formations were pushed above sea level in some areas by huge earth movements e.g. earthquakes, etc. Limestone is easily dissolved by rain water and erodes horizontal and vertical conduits in the rock . Rain water picks up carbon dioxide from the air and the soil and this acid seeks any weak points in the rock. It gradually seeps into these and enlarges them and dissolves the calcium carbonate in the limestone. The water carries the calcium carbonate until it meets air again. As the water drops from the limestone it deposits small crystals of this as calcite, first as stalactites which hang from the ceiling. The water still has a residue of calcite in it and when it drops onto the floor this forms stalagmites and when they join they become columns or pillars. Here, on the very edge of Europe, is an Island rich in the language, culture and heritage of Ireland, unique in its geology and archaeology and in its long tradition of gentle hospitality. Here is a place to sense the spirit of Gaelic Ireland, to touch the past, but with all the comforts and facilities of the present. Aran will take you back to an Ireland of Celts and Early Christians. This is an island of great peace and tranquillity, but it is also an island of great fun and activity. 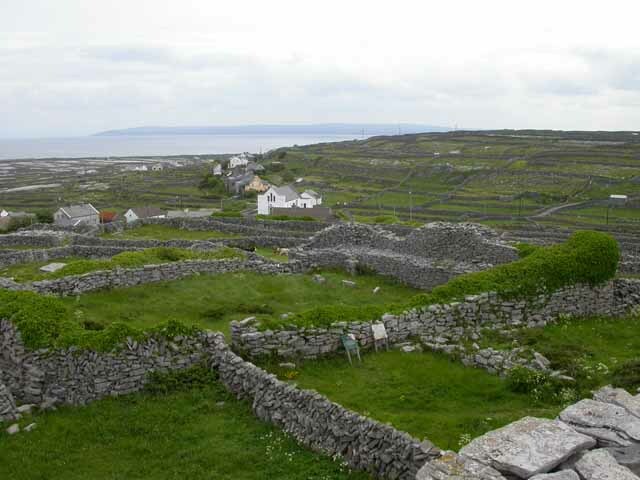 A timeless land in an endless sea, weathered monuments on awesome cliffs, great labyrinths of limestone, meandering walls, patchwork fields, quiet beaches and a welcoming island people, this is Aran in Galway bay on the west coast of Ireland… Ferry services operate daily from Doolin to the Aran Islands. Bunratty Folk Park, recreates rural and urban life in 19th century Victorian Ireland. There is an extensive array of vernacular buildings; indicative of all of the social strata from the poorest one roomed dwelling to Bunratty House, a fine example of a Georgian residence for the gentry. Traditional jobs and crafts are also represented, milling, the forge, pottery, printing, baking, farming etc. Costumed characters that recreate the traditions and lifestyle of a bygone age animate the Folk Park.